I love to work with small local companies and Rolling Greens is one of my go-to’s for house plants and small home accessories. It’s also 2 blocks from my home which can be a very dangerous thing for my purse. 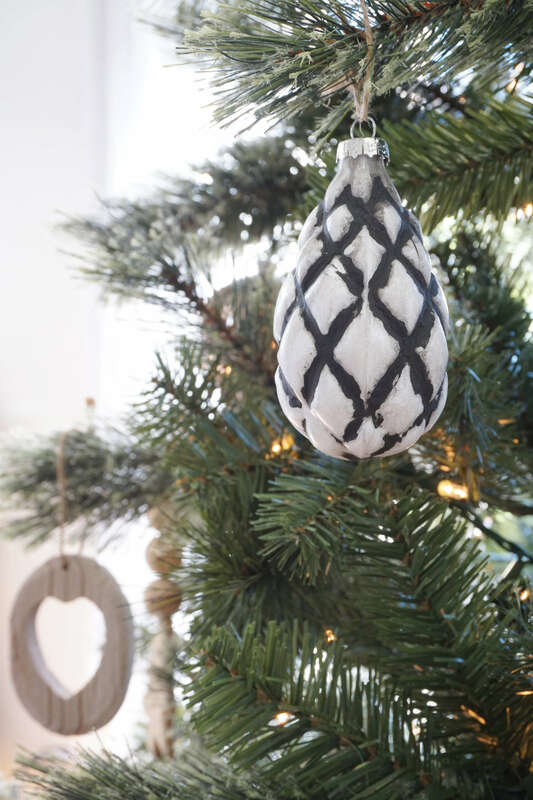 This December I teamed up with them to dec out my house for Christmas using some of their beautiful ornaments for the tree, faux garlands and plate/serving ware for a holiday table scape. 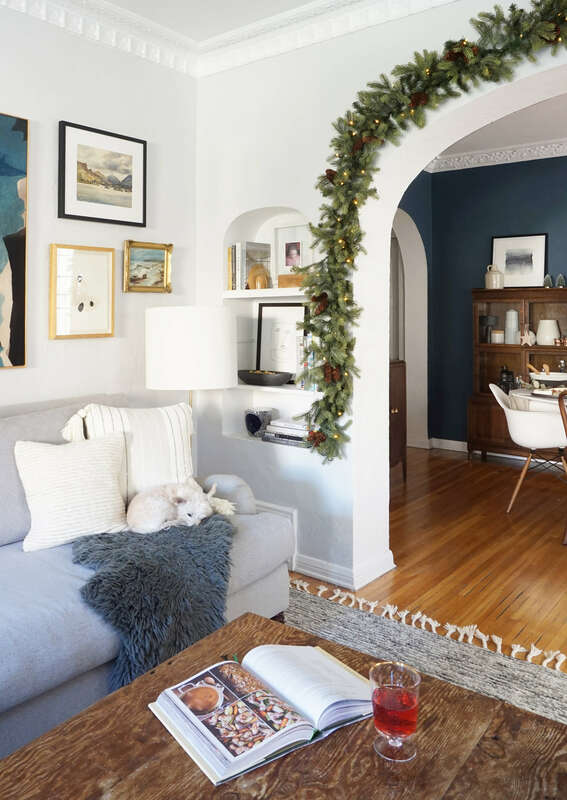 Here are a few tips I used when decorating for 2017. 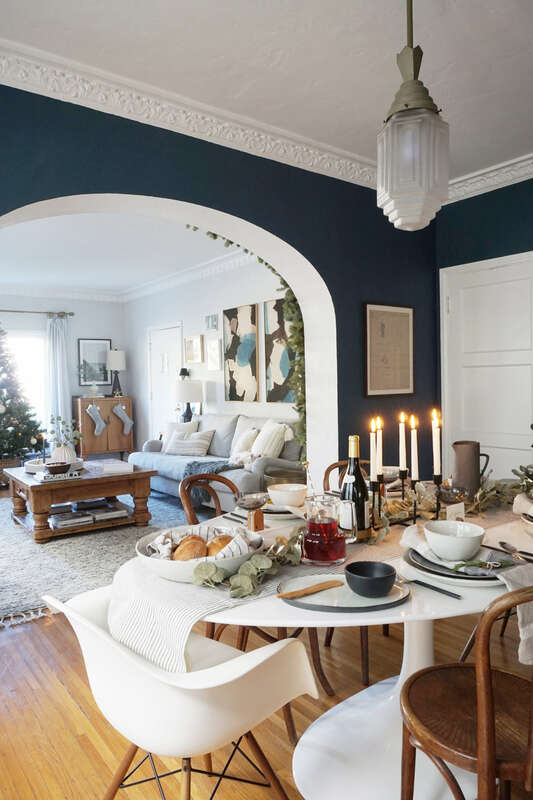 Christmas decorating can easily end up feeling a little chaotic so in order to keep it feeling calm and peaceful I channelled my inner Scandinavian Hygge and chose a neutral colour palette for this year’s holiday theme. I mixed creams, whites, wood tones and black but added some reflective gold and bronze ornaments to still keep it feeling festive and fun. 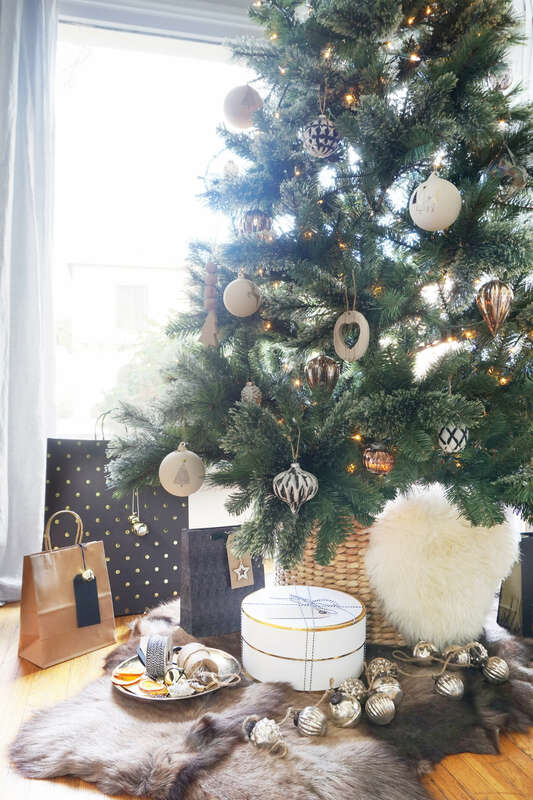 I love to add natural earthy elements to all forms of decorating and styling so instead of the usual metal foot stand I popped the tree into a basket to make it feel more homely. To give it an even plushier vibe I sat the basket on top of a reindeer hide which adds some layering to the tree and the organic shape works well agains the circular basket and acts as a platform for all your gifts to sit on. 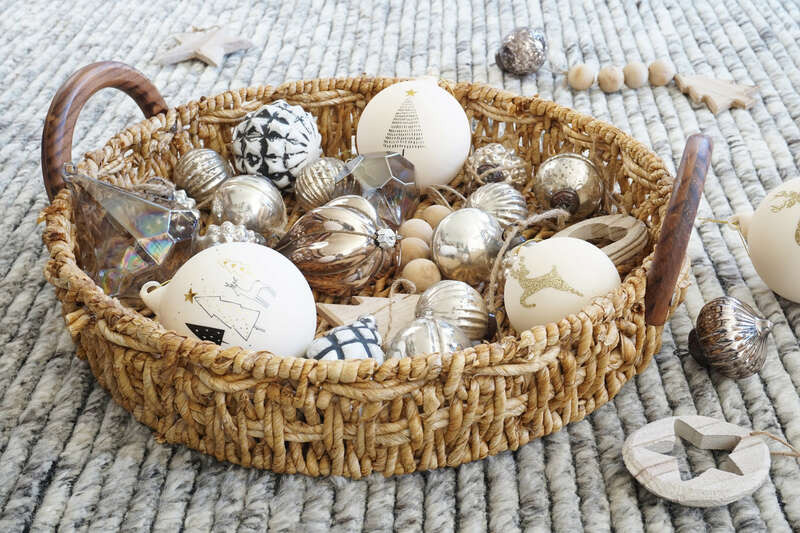 When decorating with ornaments (or baubles as we Brit’s call them) I like to lay them out in baskets first to get a feel for what will sit best next to each other on the tree. 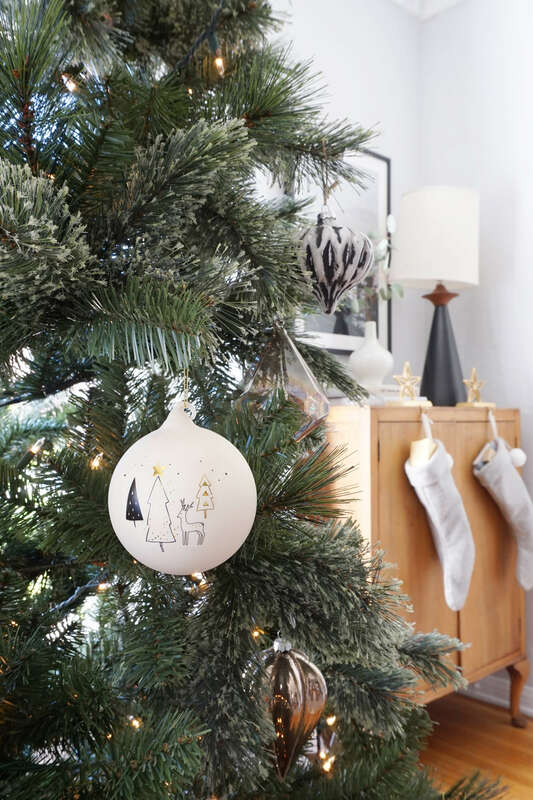 When dressing the tree I normally start off with the larger sized ornaments and then fill in the gaps with smaller ones. 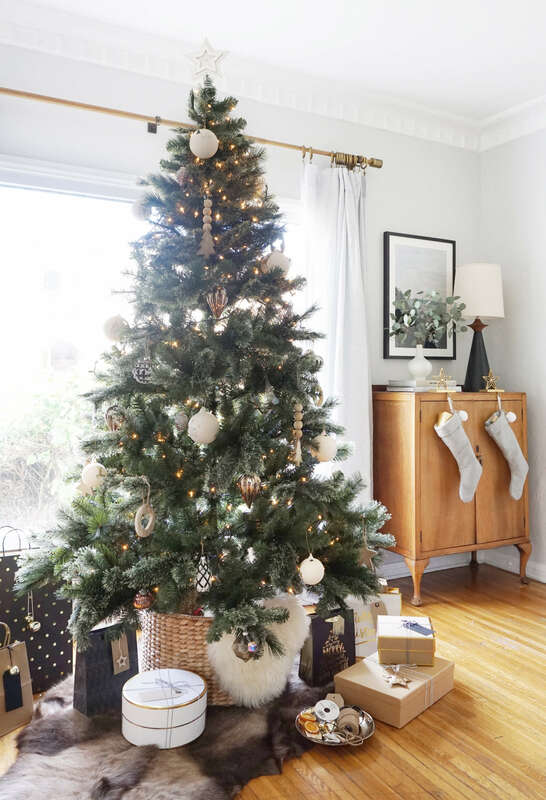 Just ensure that you distribute size, colour and material around the tree so that it doesn’t feel like you have clusters of the same looking ornaments in one place. 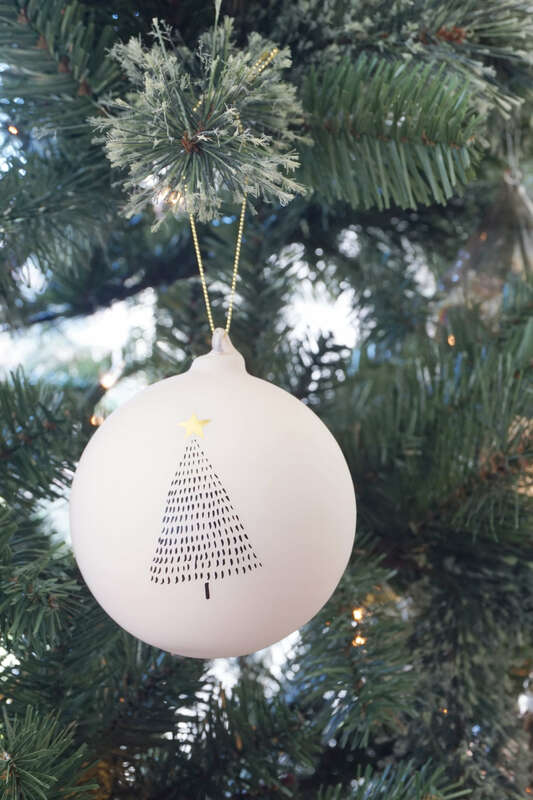 And don’t forget to decorate all around… you want to have the best looking tree on the block and the neighbours will appreciate it too! This year I had a debate about LED lights vs the traditional incandescent tree lights. I’d acquired a box of LED’s and tried them out but they looked too blue-white and kinda sad so I reverted back to the old school warm twinkly lights which makes me extremely happy. The one thing I did do this year was get a fake tree. I’m normally a huge advocate of the real tree but just couldn’t be bothered to deal with watering it and the needles dropping everywhere this year. I’ve quite enjoyed having it and since I did the first shoot in November it’s meant a could keep it up through the new year. 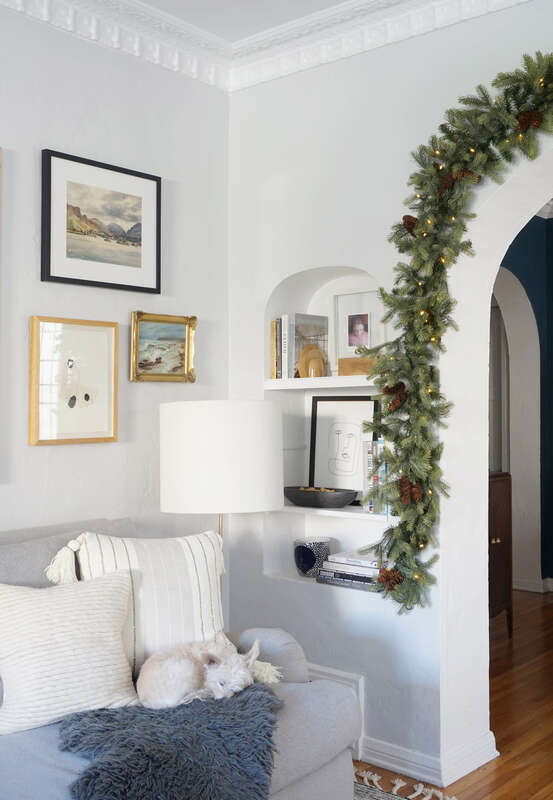 I have an array of faux garland that I’ve collected from Rolling Greens over the last couple of years. 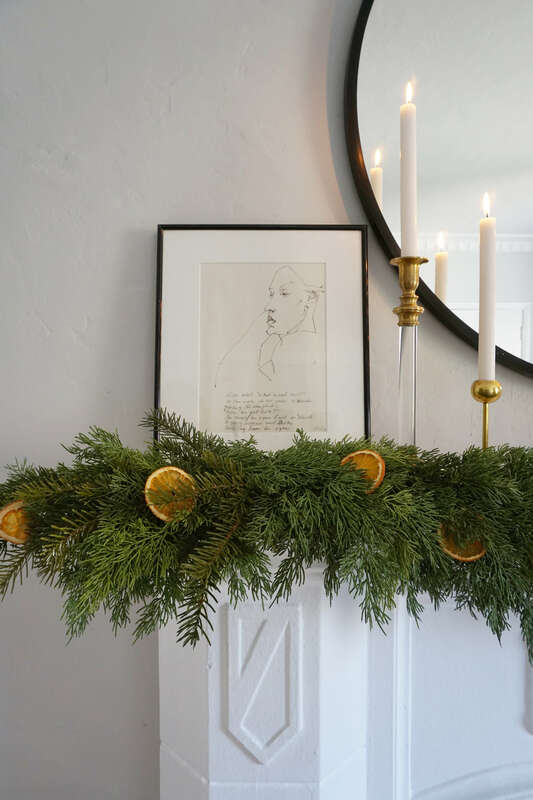 The one around the archway already came equipped with fairy lights and pine cones whereas I added the dried orange slices to the mantel garland as well as some sprigs of real pine to get that festive smell going. – Paper snowflakes tied on individually (which is something you could get kids involved with making) is a super quick, fun and budget friendly DIY. 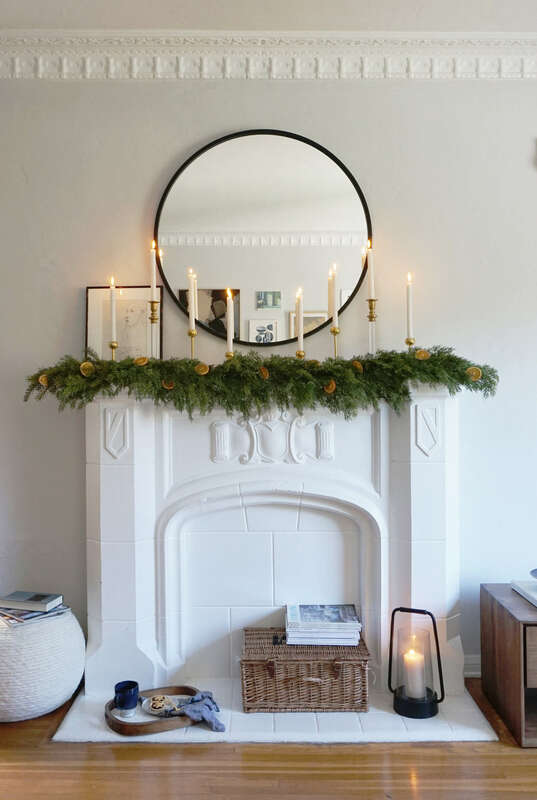 How much garland is too much garland?!? 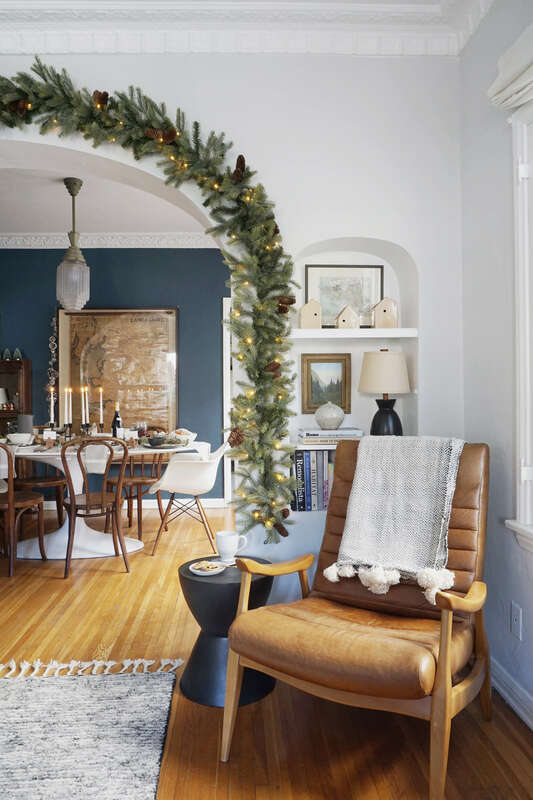 As long as it feels purposeful in that it’s draped and highlighting a focal point (mantels, doorways, windows, hutches, credenzas etc) then I say go for it. It’s one time of year you get to do this! 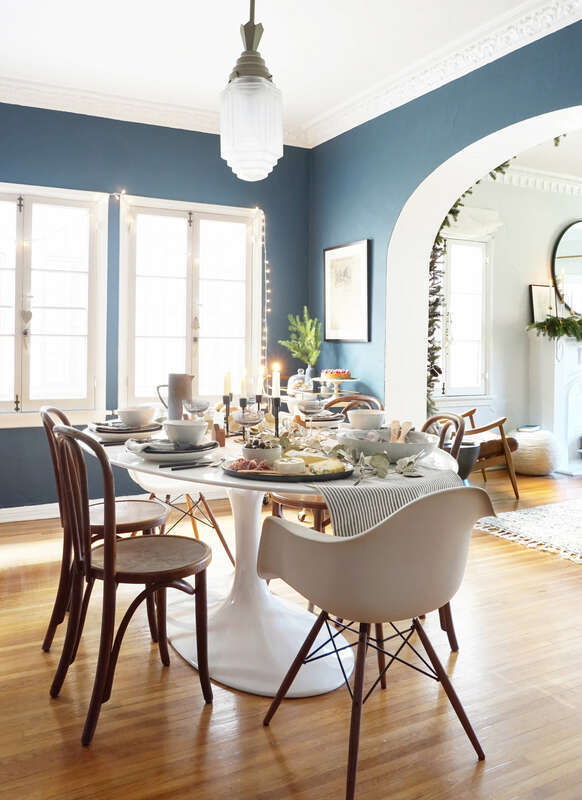 For the dining room I wanted to bring in the same simple, neutral vibe when dressing the dinner table. 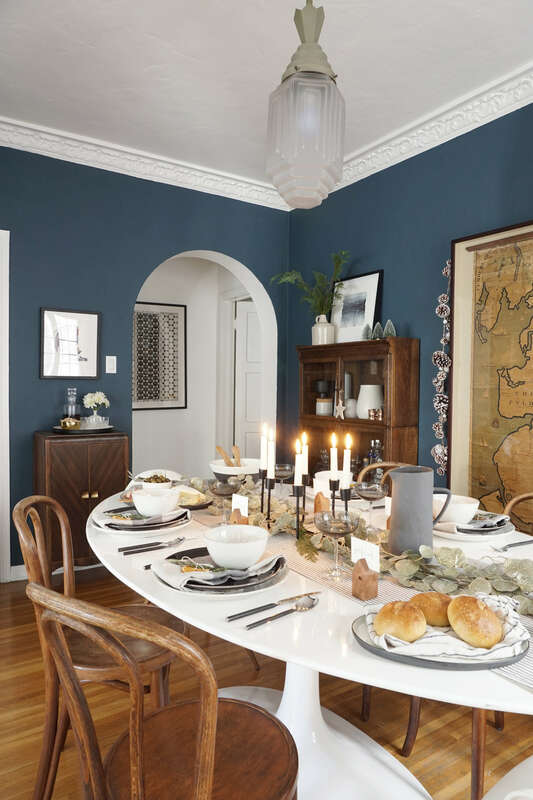 My whole vibe is layering whether it be patterns and textures or just layering old and new pieces of furniture so thats what I did with the tablescape. 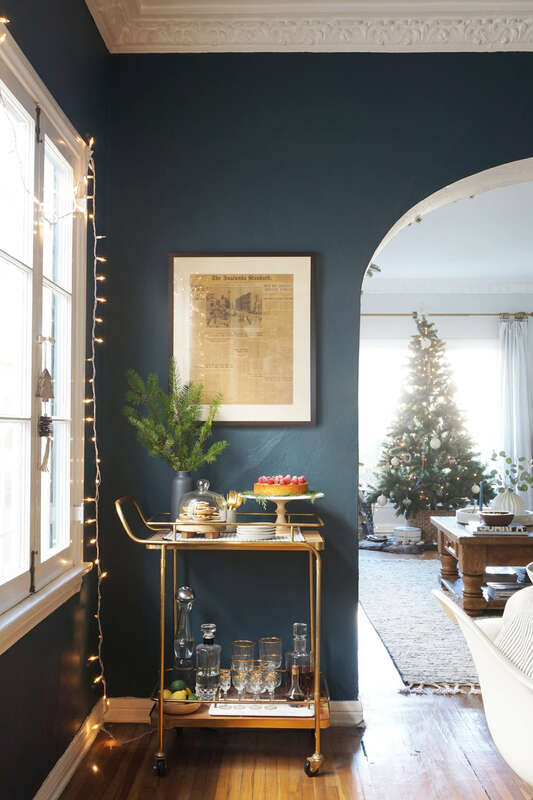 I used a black and white striped runner down the length of the table to help ground everything and also to be a platform for the faux gold sprayed eucalyptus garland to sit on top. I then added a simple black candelabra to the centre of the table with white taper candles. 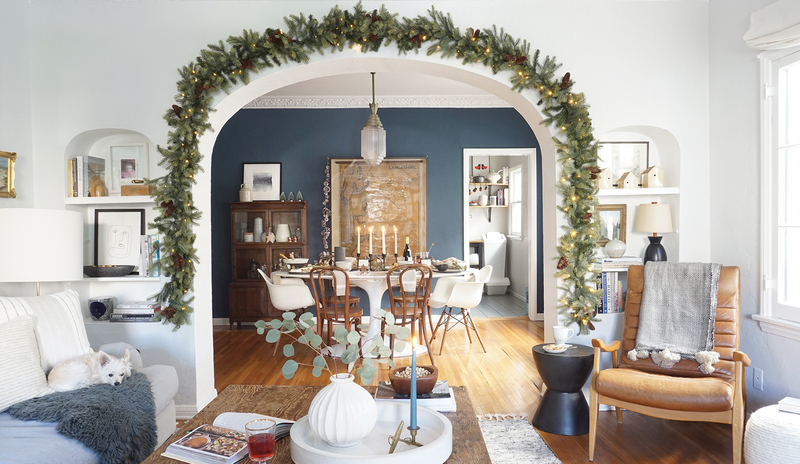 These three items are something that can remain up for the whole duration of the festive season as you don’t need to worry about the garland drying up and crumbling all over the table. 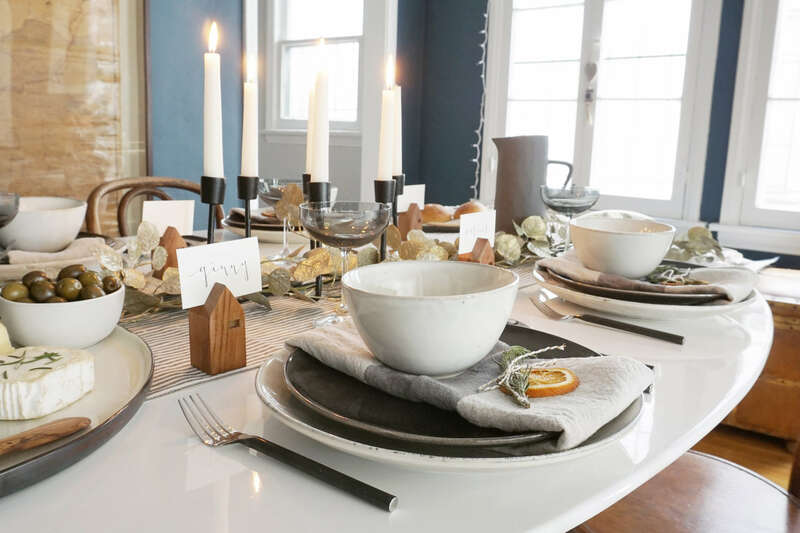 For the table settings I used these over sized hand-made grey-white dinner plates with slightly smaller glossy plates on top. I wrapped the non-matching striped linen napkin around the black plate to give the soup bowls a resting place and to break up the solidity of the black. A simple garnish of dried orange slices and rosemary sprigs were tied using gold and white threaded string and sat on top of the napkin. When setting out for dinner it’s always good to lay out your serving platters and bowls to make sure you’ll have enough room for what you’re cooking. That way you’ll know what needs to be served up in the kitchen prior to bringing out to the table. I used olive wood serving utensils and cheese knives to bring in more of the natural earthiness and break up the monochromatic tones. 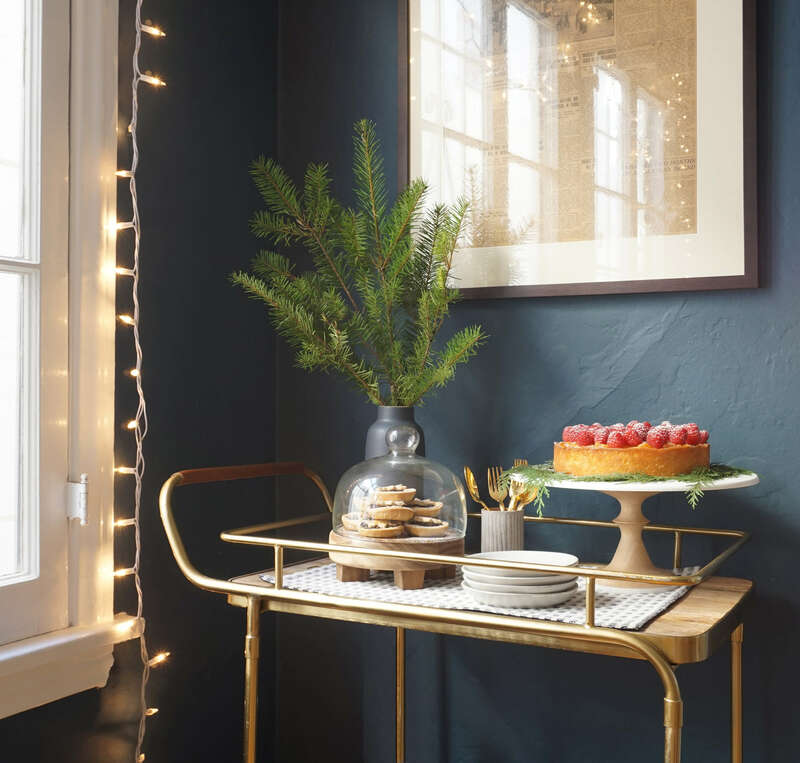 Christmas wouldn’t be complete without a festive bar cart but this time I used the top shelf as an additional serving area for deserts. I first laid down a placemat to give the surface some texture and break up the wood top and added a couple of different platforms to highlight and elevate the cake and mince pies. This helps to create depth and landscaping so your guests can see what’s on offer. So that it’s easy and quick for people to help themselves I stacked some small plates ready to go and a vessel containing desert forks and spoons. Don’t worry, I still had my tequila and amaro selection on the bottom. 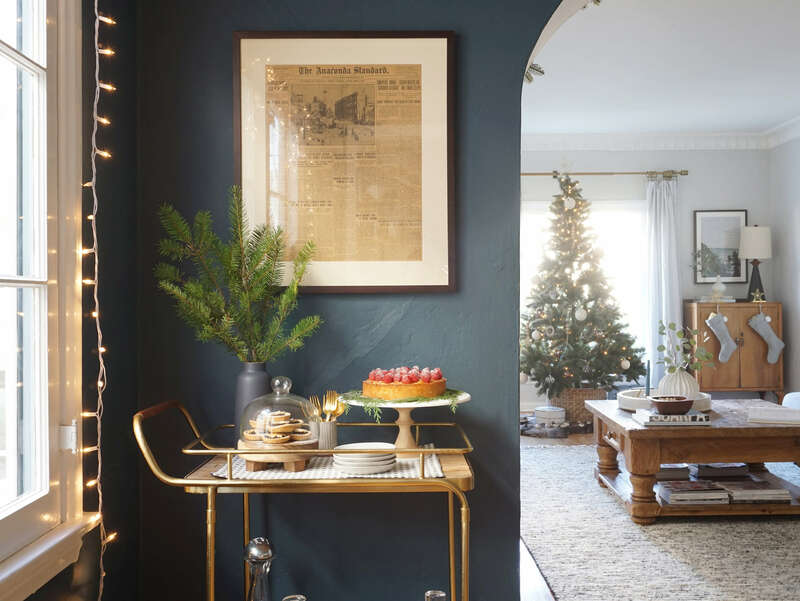 Don’t feel like you have to ‘dress’ every surface to feel like Santa’s grotto but by simply reimagining surfaces into something else adds more attention to detail without going overboard. – Set up a drinks tray on what might normally be used as table for a lamp. 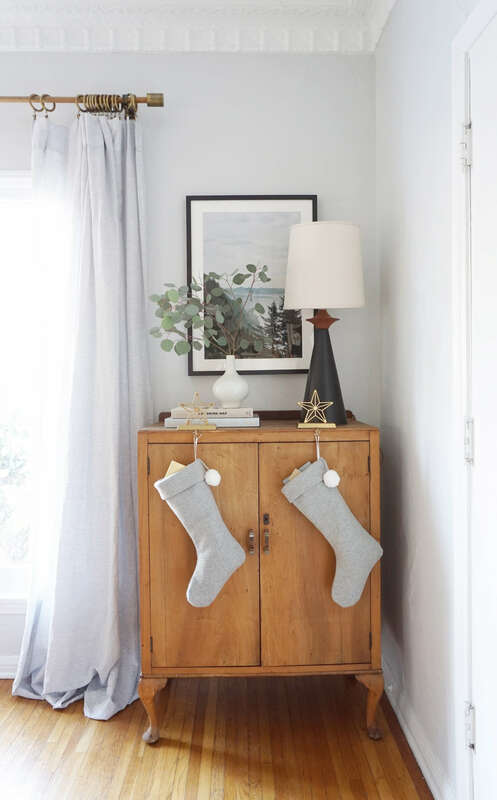 – Door handles, window latches and dresser knobs can have simple ornaments or bells hooked onto them. I’d advise against using glass ones here to you might end up with a ‘whoops’ on your floor.